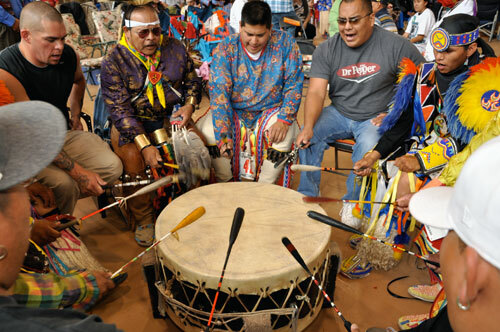 Sure, Durango Oktoberfest will have lots of beer and some hints of German-Bavarian culture, but don’t miss out on an incredible cultural gathering this weekend in nearby Ignacio, Colorado: The 93rd annual Southern Ute Tribal Fair and Powwow. The weekend-long Powwow kicks off Friday night and goes through Sunday with most of the events taking place at the Sky Ute Fairgrounds in Ignacio, about 30 minutes southeast of Durango. Photo by Jeremy Wade Shockley/Southern Ute Drum. The weekend is packed with exhibits and events, contests and concerts, parades and performances, but don’t miss the highlights: the Powwow’s Grand Entry ceremonies and Gourd Dances held Friday night, twice on Saturday and again on Sunday. Visitors can watch and listen as Powwow participants sing, drum and dance — and many will be wearing traditional tribal regalia. The tribal fair also includes a huge variety of events such as salsa and frybread contests, a jalapeno eating contest, a tipi-raising contest and a greased pole-climbing contest, as well as handgame, horseshoe and softball tournaments. The Southern Ute Tribal Fair Parade starts at 10 a.m. Saturday. Although some of the contests are open only to Native American contestants, spectators are welcome to watch and enjoy all of the activities. Check out the “live” livestock exhibits and the Native American arts and crafts exhibits that feature drawings, paintings, photography, jewelry and traditional beadwork. Most of the events will be held at the Sky Ute Fairgrounds, but check the schedule here for details (scroll down for a breakdown of each day’s events). The Quality Inn in Durango is only 25 miles from the fairgrounds in Ignacio, making us a great home base for your weekend. Book your room today! ← Raise Your Stein to Durango Oktoberfest!